The Gefen 4K Ultra HD 8x9 Matrix for HDMI w/ HDCP 2.2, HDBaseT 2.0, and POH routes eight 4K sources to any combination of nine 4K displays. It features eight HDMI inputs, one HDMI output for local viewing/monitoring, and eight HDBaseT� 2.0 outputs. The HDBaseT� 2.0 outputs extend AV and controls up to 100m at 4K to eight receivers installed at remote viewing locations. 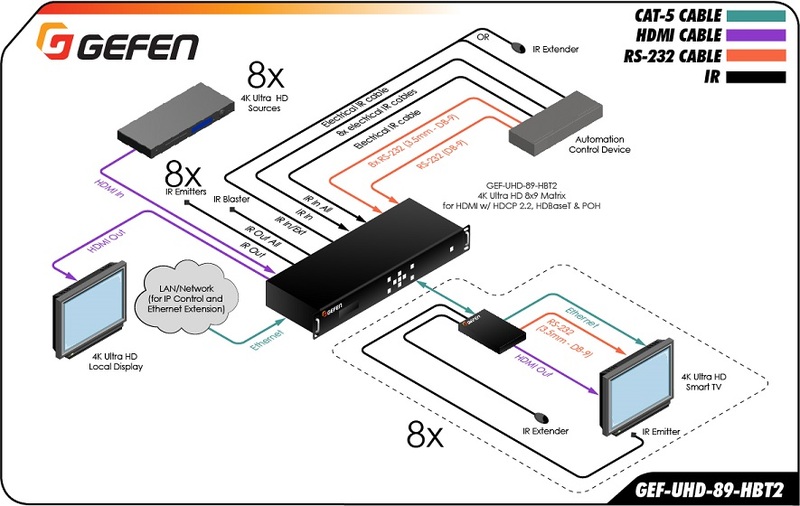 Gefen's implementation of the new HDBaseT 2.0 Colligo� platform ensures an even more robust and resilient connection than the industry standard HDBaseT�. Resolutions up to 4K Cinema-DCI (4096 x 2160 at 24 or 30 Hz 4:4:4) and 4K Ultra HD (3860 x 2160 at 60 Hz, 4:2:0 or 30Hz 4:4:4) are supported. This product is compliant with the latest HDCP 2.2 protocol as well as the legacy HDCP 1.4. The Gefen 8x9 Matrix also supports 1080p Full HD, 1920 x 1200 (WUXGA), 3DTV, and Deep Color (up to 1080p resolution). Multichannel digital audio including 7.1 channels of LPCM and HBR (High Bit Rate) digital audio formats such as Dolby Atmos�, Dolby� TrueHD, DTS:X�, and DTS-HD Master Audio� are also passed through. HDBaseT� extension between the matrix and the eight included receivers supports HDMI, 2-way IR, RS-232, and Ethernet. 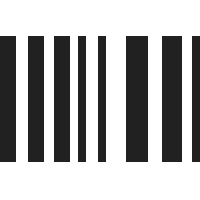 IR from viewing locations to the sources can be routed independent from video if need be. POH (Power Over HDBaseT�) technology provides power to the receiver units and other POH-class-compliant devices, using the same CAT-5 cable that extends the HDMI and control signals. The Gefen Syner-G� software's Discovery and Show-Me features simplify initial IP configuration. This matrix can be controlled via front panel buttons, a handheld IR remote, electrical IR, RS-232, Telnet, UDP, and Gefen's intuitive and user-friendly web server interface. An easy-to-read, super-bright OLED front panel display indicates routing status and IP settings. The matrix comes in a rack-mountable enclosure with detachable rack-ears for shelf-top placement. Low profile, surface-mountable Receiver units fit in tight places and accommodate Gefen locking HDMI cables for secure connections.